https://www.youtube.com/watch?v=fcOHOBSCXjM Windup Bunny 2 is a dual floating pinion all wheel drive update to my original Windup Bunny of years ago. 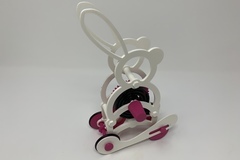 Even though Windup Bunny 2 is larger (1.5 times) and heavier (120 grams versus 64 grams) than the original Windup Bunny, it runs faster and further thanks to its dual floating pinion / rotating pinion gear carriage design along with a stronger spring. I've designed rear wheel drive floating pinion models before that utilize both gravity and rotational momentum in order to disengage the rear axle from the spring motor once the spring motor energy is depleted. Windup Bunny 2 is more complicated in that it is all wheel drive thus both the rear and front axles must disengage from the spring motor in order to coast and / or function as a push / pull toy. In order to accomplish this, the design incorporates a rotating dual floating pinion carriage with a rear mass heavy enough to disengage both the front and rear axles from the spring motor once the spring motor energy is depleted. Windup Bunny 2 is another favorite of our kids and grandkids, providing both a windup and push / pull toy for the older and younger family members. And while much sturdier than the original Windup Bunny, it does require patience and finesse to print, assemble and test. As usual, I probably forgot a file or two or who knows what else, so if you have any questions, please do not hesitate to point them out as I do make mistakes in plenty. Designed using Autodesk Fusion 360, sliced using Cura 3.5.0, and printed in PLA and Tough PLA on an Ultimaker 2+ Extended and an Ultimaker 3 Extended.